Gary Scales is a Ph.D. student in the Department of History. His research focuses on the cultural history and built environment of the twentieth-century United States. His recent work explores the role of gas stations in the development of economic, cultural, and social spaces in American suburbs between 1911 and 1990. He is currently examining the relationship between material culture and digital methods through a study of the cultural and historical importance of the payphone in urban America. As the inaugural Department of History Graduate Fellow in Digital History in 2016, his worked utilized GIS, digital modelling, text-mining, web development, and Python programming. He has served as a Research Assistant for digital projects at the University of New Mexico in 2015, and the DSC at Temple University in 2016 and 2017. 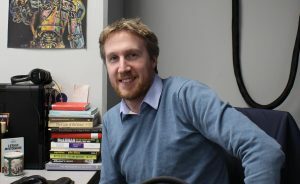 He manages and develops the Department of History Wiki, and teaches undergraduate courses on American history and the history of global sport using a variety of digital tools. He has presented his work in the U.K., the United States, and Germany.